We all wish our workshop had one of every tool imaginable. Or maybe that's just me? The reality is that few of us have the budget to purchase such an armada of tools, and quite frankly, it would be silly to do so. For the average DIYer, there's some tools you may only use once a year or once in a lifetime. Rent these following tools and use the money you saved to buy those everyday tools. If you get the floor nailer then you'll definitely need to get one of these. And if you already have hardwood floors but they're looking a little worn, then this is your ticket. One doesn't need to refinish hardwood floors that often so this is definitely not a tool you'll be using regularly. Let's be honest, how often do you want to remove all your things from a room to do projects like this? 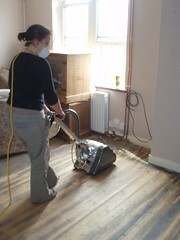 When you rent it, make sure you get an orbital floor sander. These are newer than the traditional drum floor sanders and have the benefit of being more forgiving. A drum sander can easily make deep grooves in your hardwood floors if you're not careful and leave it in one spot too long. 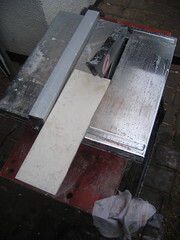 Unless you plan on multiple large tiling jobs, renting a tile saw is the way to go. Smaller and cheaper saws have a tendency to spray you with water so you're soaked by the time you're done making all your cuts. The more expensive models, one one's you'd rent, can keep you dry and focused on your cuts and your tiling job -- not your favorite tee shirt getting ruined. Ah, the joys of spring cleaning. Isn't it nice it only comes once a year? 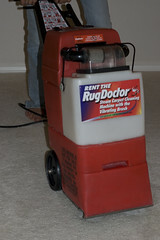 There's no better way to get those carpets nice and clean by getting them cleaned. Save a few bucks and rent the cleaner yourself -- it's easy to do and you can clean to your heart's content or run out of rugs. It's not something you want to do often (your rugs won't like it) so renting is the obvious choice. When you have a "small" project that needs some cement, you'd be surprised how many bags you might have to mix. And if you've mixed cement by hand before you know it doesn't take many bags before it becomes a laborious, annoying task. If you're building or buying a pre-made shed, the cement pad will use a lot of cement. Even if you use some Sonotubes, you'll find by the time you're done you can save a lot of time and backache by having the cement mixer do the work for you. Naturally, this list is only a suggestion. Your mileage will vary depending on what projects you're really trying to tackle!